Filled with the Spirit and wisdom. A fruitful private prayer life with Power. Being an example for others to follow. A Biblical understanding of self. Focused and wholehearted devotion to God. A contributing member of the Body of Christ. The wisdom to deal with failure. Question: What is hindering you from taking the leadership plunge? Question: How active are you in being mentored and mentoring others? Question: What are you willing to do to know Him better? Even though people may follow us, we must never see them as “our” people. Our task is always develop people in their relationship with Him. Question: How do you lead people God has placed in the care of another leader ? 2. We’ve all been mentored before. Write the names of the people who have had a significant impact on you during specific times of your life. 1. Mutually establish the purpose and direction of the group. 2. Determine the frequency of interaction, how often? 3. Determine what level of accountability you both are to observe. 4. Mutually establish the life cycle (length of time) for the mentoring. 5. Honestly evaluate the purpose regularly. 6. Frequently modify expectations to fit the purpose. 7. When the life cycle is finished and expectations have been met, bring closure, or set a new life cycle. 8. Write down what you have learned and what steps you will take to accomplish this. Mentoring is not only an important ingredient to successful spiritual growth, but it is a command of the Lord as well as seen from Matthew 28:18-20. 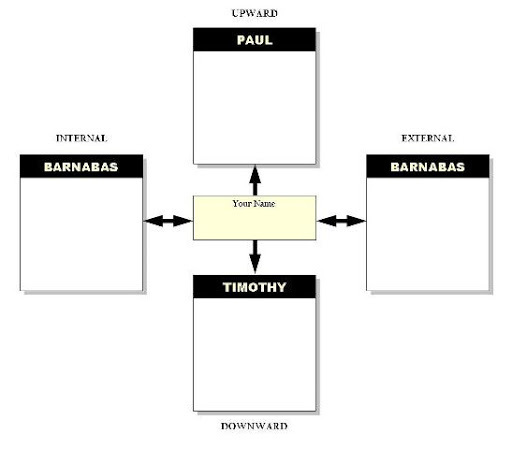 Below is a chart that will assist you in identifying important relationships you need to be successful in the ministry and in life. 1. On a sheet of paper, draw a large “plus sign.” You can also duplicate the chart above. This illustrates a well rounded mentoring way of discipling and accountability and is an important activity in finishing well! It consists of developing important relationships of accountability with more mature Christians (upward), with people our age and spiritual development (external in and out) and with emerging Christians (downward). 2. Write the names of people who might fit in the following categories. Lateral internal & external – A “Barnabas” is a someone who is a peer and who will hold you accountable and love you during difficult times. It is good to have those involved in your church (internal) and those who work with you (external). Galatians 2:11At the top list people who are mentoring you. They can be contemporary (living) or historical (not living) models. 3. If you lack names in any of the four categories, begin to pray and seek the Lord concerning people who can (and who are willing and able) assist you in the process of successful mentoring. Remember to use the “Steps For Successful Mentoring” above. This entry was posted in Discipleship Part 3 - Mentoring. Bookmark the permalink.